Today’s customer service industry is highly competitive. Customers are more demanding and powerful than before. They also possess more knowledge than they did previously and can be known to hold companies to difficult standards. If your intention is to impress your customers and keep their business, you need impeccable customer service. And that means omni-channel and consistent support. Why omni-channel assistance? According to a recent study by the Aberdeen Group, best-in-class companies deliver consistent messages to customers across all channels and 89% customers dislike repeating their queries. This post contains a list of 10 omni-channel customer service tips that you can use to surpass your customers’ expectations and make a mark in your business. If you run a business in 2018 and can’t offer uncompromised support on mobile, you will face the wrath of frustrated customers. Today’s market prioritizes accessibility of companies, and mobile phones are among the most popular easy-access media. In fact, 87% customers actually use mobile devices to make purchases and often complain that customer service via mobile is unsatisfactory. Ensure that your FAQs, documentation and self-support videos are mobile-friendly. Explicitly display your customer service button on your mobile website/app landing page. Enable an easy contact service such as dial-for-support or live-chat-for-support that is designed for mobile devices. Give customers a prominent, easy-access but non-intrusive way to communicate with you without having to leave your homepage. Make customer service links single-tap sensitive. Create a real-time tracking system for mobile-based customer service queries. Customers today have a low tolerance towards technical difficulties and want instant resolutions. That’s why they tweet to get a response. Twitter (and other social media platforms) has provided customers a way to catch the attention of companies and have them resolve customer service issues instantaneously. In fact, 42% of the customers who participated in a study said they expected companies to respond to social media mentions within 60 minutes! Understand your customers’ expectations when they post on social media, anticipate their needs and then address their concerns. Ensure that you respond to all queries within the first 60 minutes and if you can’t offer a resolution, acknowledge the queries and reassure customers of a response. Invest in setting-up keyword tracking for your social media pages to ensure that you never miss any customer’s comments. Also, integrate social media with live chat to provide seamless customer support. Customers love quick-resolve routes that are present the least hassles. This is particularly true of enterprise and high-level customers who are represented by executives who have little time on their hands. Such customers can’t be dealt with on a schedule because they need to be prioritized, and nothing says priority quite like a face-to-face call. In fact, according to a Forrester study, interactive chat can result in as much as a 120% ROI in a 6 month payback period. According to a Forrester study, interactive chat can result in as much as a 120% ROI in a 6 month payback period. Employ a reliable live chat software such as acquire that can be installed on your website and app across devices, so you can stay provide omnichannel assistance to customers. Create a script that doesn’t sound robotic and leaves room for improvisation, based on each customer’s specific requirements. Use a CRM or a set of notes to store important information about customers, so you can refer to it for context before you attend to a customer’s call. Keep product manuals and resources handy, so you can send them across to your customers during your call. Stay on topic as much as possible and allow customers to lead the call with their requirements. A good segment of your customers, 50% according to this Zendesk study, want to resolve their issues by themselves, without having to involve your customer support team. Catering to such customers is critical because they’re the ones that will cost your customer service team the least and turn better cost-to-profit ratios. Such customers are usually satisfied working with self-serve FAQs, documentation and video content. 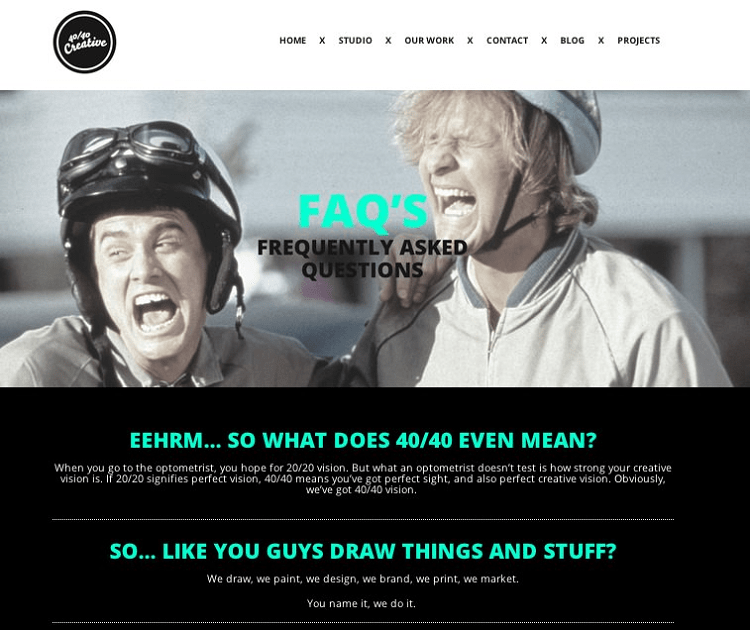 Ensure that your FAQs are comprehensive but organized and easy to navigate. Create A/B tests for your FAQ and documentation landing pages so they can be optimized for the best design and ease-of-use. Hire the best copywriters to create killer copy that turns customers into returning customers by offering an excellent self-service experience. Email is still relevant in the customer service industry, according to an eConsultancy report. And email should be part of your customer service system because it’s easy to manage, still effective and can resolve a good number of your customers’ queries. Email customer service is especially easy to manage because of CRMs today that offer email automation workflows that can save your customer service executives a ton of time and effort. Don’t set and forget. Return to your automation workflows, measure their health from time to time and optimize email drafts and automation schedules. Consider using an actual email for replies so your customers feel cared for and can interact with the automated messages that you deliver to them. Aim at resolving common issues in a completely automated fashion, so you only have to deal with unusual activity. Understanding customer needs and behavior is a key to providing effective customer service. According to Brian Tracy, all customer purchases are driven by eleven basic needs which are money, security, status and prestige, health and fitness, praise and recognition, power, influence, and popularity, leading the field, love and companionship, personal growth and transformation. These needs can be addressed when managing customer service. Track every customer’s journey using tracking software and CRM, so you have data to understand which phase they’re in and what you can do to enable conversions and excellent customer service. Use customer data to anticipate customer needs even before you speak to them. For instance, if your data says that every customer who buys Product A will eventually need to buy Product B as an accessory, then you can ensure that there’s enough of Product B in your inventory. Improve internal customer service processes using customer behavior data. For instance, you can run customer feedback surveys and fine-tune your services. Wufoo’s Kevin Hale has two great ideas that involve customer behavior data. 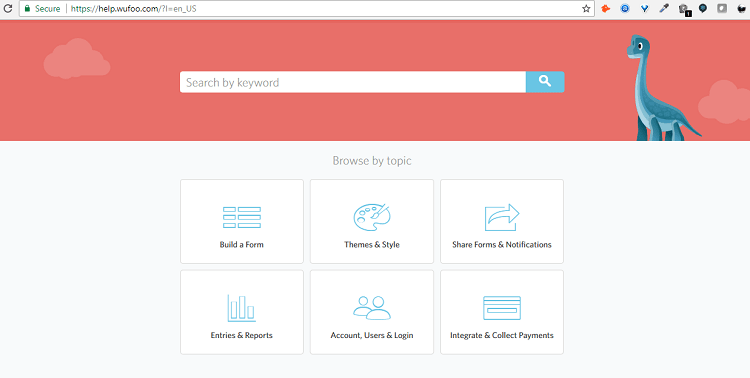 The first is to use website page analytics to optimize your FAQs and documentation. Look at the beautifully and customer-focused design of Wufoo’s document libraries. The second is to run small experiments to reduce customer service issues. Wufoo implemented emojis on their customer issue report form and noticed a huge drop in angry complaints. Company culture affects customer service and how internal rewards can motivate customer service executives to behave the right way with customers. If the tone of your customer service is set to be rigid and not flexible, your executives will embrace the same tone when interacting with customers. And in a large customer service system, it’s hard to track the quality of service and ensure that it stays up to standards, so setting the tone initially is crucial. Before you create an internal reward system, outline what you want your customer service executives to accomplish and how you will measure it. Consider your investment and project your ROI. For instance, if you get repeat business from a customer whose issue was successfully resolved, you could give reward points to the executive who handled the issue. The reward doesn’t always have to be monetary. You can offer customer service executives a free celebratory meal, discount coupons or even recognition for top customer service executives. Ensure that all customer service interactions are tracked/recorded and reviewed from time to time. You could even use software that requests and records customer service feedback so you can decide which interactions require close inspection. Consider building a reward system into your customer service system so you don’t have to monitor performance and reward points manually. The online experience affords an unparalleled insight into understanding customer struggles by allowing customer service executives to view data of every click, swipe, and tap that occurs on a browser or an app. And now there are multiple platforms through which your customers can engage your brand and being present and proactive on those platforms can go a long way with sales and customer service. For instance, if your customer has made a request/query on one platform, they wouldn’t want to repeat the same on another. And according to Aberdeen Group’s report, companies that provide consistent service across platforms retain 89% of their customers. Ensure that you have tracking set up on off-domain platforms via paid advertisements, blogs, PR partners and social media using a URL builder such as the one Google offers. This tool will basically add a UTM or Urchin Tracking Module parameter to your URL, so it can be tracked to every unique source. Use an email marketing tool that allows tracking of email delivery opens and clicks so you can track all communication via email, including customer service emails. With open and click data, you can assess when the best time is to follow an email with a call. You can use tracking pixels and segmentation to enable email tracking and data collection. On domains and apps that you use, you can use domain-side tracking to collect IP addresses, user agents and any data that gives you useful information about your users. Use a CRM to track and update customer interactions across platforms. According to a study conducted by SHRM (Society for Human Resource and Management), hiring by poor culture fit can cost an organization between 50% and 60% of a person’s annual salary. And this can reflect on that company’s customer experience, especially when the wrong employees are made to directly interact with customers. That’s why it’s critical for any organization to hire customer facing employees who fit that organization’s culture and values well. Before you hire to match company culture, it’s critical to define your company culture and values. What does your company stand for? What are important goals and what practices can you request employees to follow to enhance customer service? When hiring, test the candidate’s ability to reflect on and apply your company values to different situations. It’s important to know that the candidate doesn’t just agree with your work ethics, but also embodies them. Expose potential candidates to your work culture and enable them to see the large-picture of what it’ll be like to work with you. Give them office tours, allow them to interact with employees and hang out at the office for a few hours before any decisions are made. It all comes down to empathy. Even with the right technology, you can’t provide commendable customer service unless you have empathy. It begins with how you craft the customer experience, to how to build your product and your customer service system. What your customer service executives say to customers via email and calls matters. An insensitive customer service executive can lose you customers and revenue. It isn’t enough to give your customer service team a script, You have to make them understand customer pain points and frustration before giving them access to your customer base. 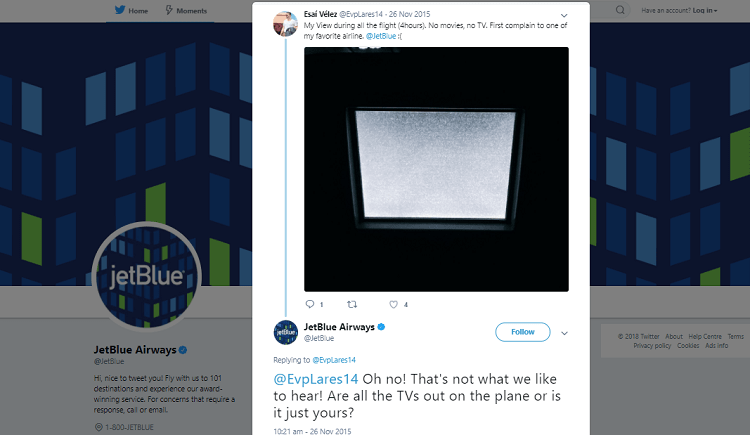 Here’s an example of JetBlue’s extremely empathetic customer service. Consider what’s the best way to display empathy in all customer interactions. Focus on the copy you create for different customer support channels. Ensure that every copy shows empathy and allows customer service executives enough flexibility to solve unique customer problems. Conduct workshops and train customer service executives on how they should handle customers from time to time. The way your company conducts customer service in today’s market can affect your rate of success and directly affect your revenue. With the right customer service technology, talent, and strategies, you can transform the performance of your business.